Petters discusses a pâte de verre technique she has been developing which offers an immediate, expressive way of applying drawing and writing onto glass. 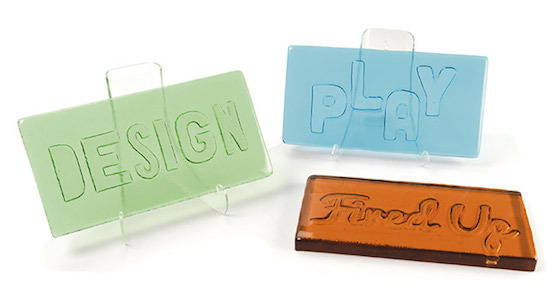 Create letters (or numbers or other graphic imagery) in a luscious slab of glass with an X-Acto knife, ceramic fiber paper, and the right amount of heat. Join artist Stacy Lynn Smith for this expanded version of her popular powder printing class. Learn the basic principles and materials needed to create a juicy, thick, solid-glass tabletop in this unique workshop led by Nathan Sandberg. Bring your Bullseye glass (or piece made of Bullseye Glass to be coldworked) to one of our Resource Centers and enjoy access to tools, kilns, and non-glass supplies. Eligibility: Anyone who has taken a class at Bullseye may sign up for Open Studio. We do not teach kilnforming techniques in Open Studio, and you must have the basic knowledge and skills necessary to complete your project. Advance registration is required. Learn more + get session dates for all Resource Centers. Bullseye Glass Co. is a leader in promoting glass art worldwide through quality production of colored glass for art and architecture, research and education, and the presentation of innovative glass art in its galleries.